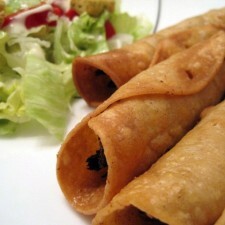 Homemade chicken flautas served with a salad. The other night I was in the mood for one of my favorite Mexican foods, so I started browsing and came across a recipe on TheKitchn.com for homemade chicken flautas. I played around with it a little bit and made it my own and they turned out amazing! You can even play around with it some more and try different meats like pulled pork, steak, or ground beef. I of course used coconut oil for frying because of how heat stable it is. This recipe will definitely be added to the regular rotation at my house. This recipe makes 18 flautas. I halved the recipe and it made more than enough for two of us. Preheat the oven to 325°F. Fill a Dutch oven or cast iron pot with a few inches of coconut oil and heat on medium-high until it reaches 375°F. Heat a stack of three to four tortillas in the microwave for about 20 seconds to soften. Place two tablespoons of chicken mixture into the middle of the tortillas and sprinkle with crumbled queso fresco. Tightly roll each tortilla and secure with a toothpick(s). Using long tongs, carefully add each tortilla to the oil, gently clamping closed for a moment to help the shell set. Adjust the heat as necessary to maintain the temperature while frying. Cook the tortillas until very crisp and light golden in color, about 1-2 minutes. Shake off the excess oil back into the pot before placing the flauta on a paper-towel lined sheet pan. Continue rolling and cooking the tortillas in batches, making sure to return the oil to 375° in between batches. 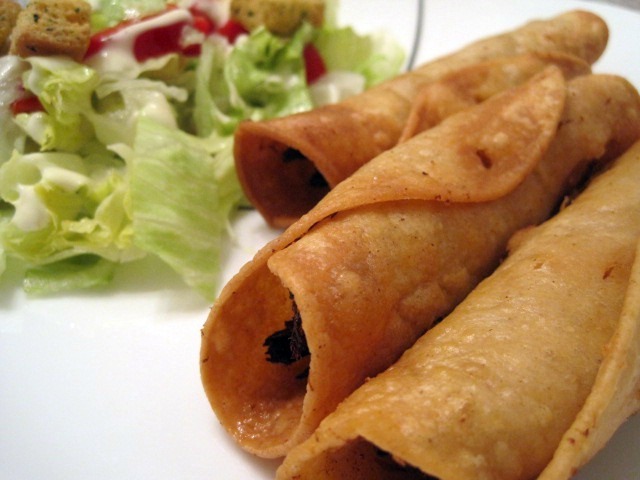 Hold the cooked flautas in preheated oven to keep warm until finished frying. Serve with sour cream, salsa, or guacamole, plus your favorite salad for a complete meal. This sounds great. But I have recently gone grain free. However, I have found a chia tortilla recipe that I love so can try that with coconut oil. Thanks. Chia tortillas sound great!! We have lots of grain-free recipes, so please visit us again! This sounds delicious!! I love flautas! Does this qualify me for the free sample? This is definetly something I should try. It’s different from the way I was raised to make it. This sounds great. But I have recently gone grain free. However, I found a chia tortilla recipe I really like, so will have to try that with the coconut oil. Thanks. This looks really delicious, can’t wait to try. These look delicious and I can’t wait to get coconut oil and give them a try! This sounds wonderful! I will definitely have to try this. Good morning , when I read this the first time i loves it and had to try it. they are delish i must say. I signed up for the free sample of coconut oil but i just couldnt wait. love you guys thanks for all the great ideas. next is treats for my pooch. So glad you liked them Samantha! I definitely fell in love with them and won’t be ordering flautas out at restaurants anymore. Let us know how the dog treats turn out, my dog loved them!